This building, set in the historic barrio of Almagro and a beautiful architectural tribute to the golden age of Buenos Aires, was built in 1924 by the architect Bottini. In March 2010, we converted it from a family home into a Tango home: La Maleva. The house now features all the regular spaces of a home, as well as four superbly decorated guest rooms, three handsome suites, a rooftop terrace with a sun deck, a hammock, a dance floor, and a parilla (bbq), and a spacious dance studio fully equipped with a long floor-to-ceiling mirror, a stereo system, and a large variety of music. The spirit of La Maleva is that of a home rather than a hotel. We have created spaces in which you might delight in a quiet moment to yourself, but lively asados on the terrace, mate in the kitchen, dancing in the Studio, and late-night talks about the intricacies of Argentinian culture are regular happenings here, because we enjoy the idea of a life shared among friends. We hope that your stay at La Maleva will be memorable, as we strive to make this the perfect place for you to come home to as you experience the magic and adventure of Buenos Aires. La Maleva offers a variety of popular tango classes and events throughout the week. 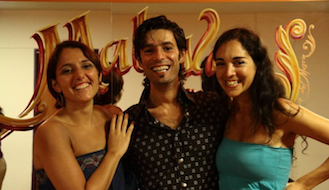 Every day you have the opportunity to learn from the best teachers of tango in the city, get connected with other fellow travelers and dancers in guided practicas, and enjoy performances by some of the most talented local musicians. Whether you are interested in perfecting your dance technique or just looking for a place to connect and socialize, you can expect to be welcomed by the friendly community at La Maleva.